If this is your first 4WD vehicle, it can be confusing to know when to use the four-wheel drive in your Jeep and when not to. You may also be wondering the differences between part time 4WD and full time 4WD. For starters, it will help if you know what the differences are between the various types of drive systems, particularly Jeep four-wheel drive systems. Many people think that 4×4 means all 4 wheels are driven at the same time — but this isn’t necessarily the case. When your vehicle negotiates a bend in the road, the differential in the axle compensates for the fact that the outside wheel travels farther than the inside wheel does. Therefore, it allows a speed differential to exist between the 2 wheels. Since energy always takes the easiest route, the differential abides by the laws of physics in this case. So, if one of your wheels is on a slippery surface (like ice) then all of the energy will be sent to that wheel and away from the wheel that currently has good traction. However, as a result, you will lose all forward motion! When 4WD mode is engaged on your Jeep, the front and rear axles are locked together, so at least one wheel on each axle can be driven by the engine effectively. You can force a 4×2 vehicle to act similar to a 4×4 by gently pressing the brake pedal. This slows down the wheel that’s spinning and transfers energy to the wheel that has traction. Must read: Is it time for you to buy a four-wheel drive Jeep? Your Jeep will have one of the following configurations. You should know which type of configuration yours has. 4×4 (4WD) – The first figure is the number of wheels. The second figure is the number of “powered” wheels. 4WD is commonly used to describe a vehicle with four-wheel drive. Jeep’s official 4×4 glossary of terms. 4×2 (2WD) – As with 4×4, the first figure is the number of wheels. The second is the number of “powered” wheels. However, with 4×2, engine power is transmitted to only 2 wheels — usually the rear wheels. 2WD is commonly used to describe a vehicle with two-wheel drive. 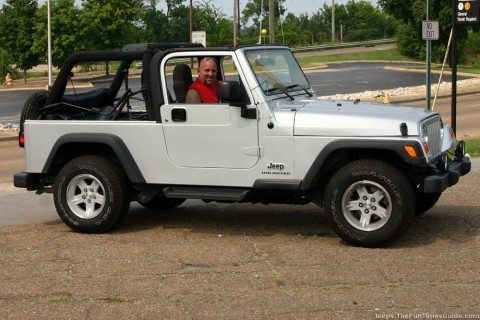 Owning A 4×2 Jeep – An Oxymoron? Part Time 4 Wheel Drive (Part Time 4WD) – This refers to a four-wheel drive system that operates on-demand and drives all 4 wheels by locking the front and rear axles together via a shift lever. It usually includes 2 speed ranges (Hi and Lo). Part-time four wheel drive systems must be operated in 2WD mode on dry pavement, because they’re designed to be used only in special situations when extra traction is required. Full-Time 4WD (Full Time 4WD) – This is a four-wheel-drive system that can be operated continuously on all surfaces. It powers all 4 wheels at all times. A full-time 4WD system may include the option of part-time operation (allowing you to shift into 2WD on dry pavement, for example) and may or may not have Hi and Lo speed ranges. Automatic Four-Wheel Drive (Auto 4WD) – A drive system that automatically engages 4WD as needed. When internal monitors sense differences in individual wheel speeds (indicating that a tire is slipping), then 4WD is automatically engaged. All-Wheel Drive (AWD) – A full-time single-speed system designed to supply drive power to all 4 wheels consistently. The percentage of front/rear power delivery varies from system to system. Shift on the Fly – A drive system that allows manual shifting from 2WD to 4WD Hi without coming to a stop. Most drive systems have a recommended speed limit at which you can engage the system. Typically, it’s below 60 mph. Check out Jeep’s official 4×4 basic FAQs.